Share the post "Center for Health and Human Performance’s David Sanders Discusses the Athlete as Artist"
Mason Gross School of the Arts. 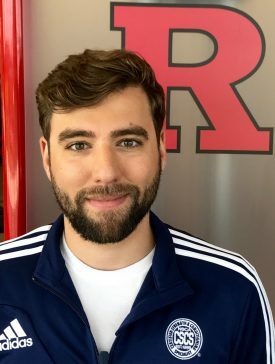 David J. Sanders conducts research at the Center for Health and Human Performance (CHHP) at Rutgers University under the guidance of Shawn M. Arent, director of CHHP. At the center, which is part of New Jersey Institute of Food, Nutrition, and Health, Sanders trains and studies performance variables of athletes, including the Rutgers Women’s Soccer team. Recently, Sanders looked into the effects of weight training on body composition, muscular strength and power, and physical self-perception in college-aged dancers. He delivered a lecture, “Dancer: The Athlete in the Artist,” on February 3 when Mason Gross Extension Division hosted American Ballet Theatre Day (ABT). The event, presented through a partnership with American Ballet Theatre, was a day of master classes and workshops for dancers from 4 to 18 years old and was open to the public. David Sanders. Photo: Rosalie O’Connor. Absolutely. Many dancers I’ve talked to see themselves only as artists. Yes, the art will always be of utmost importance to the dancer, but dancing is a performance, and that requires great muscular strength, power and coordination. When should dancers begin thinking about strength training? Now… the sooner the better. There have been concerns about strength training in children with safety and stunting growth. There has been no scientific evidence to support these anecdotes. But training children will be different than training an adult, focusing more on movement proficiency, as lifting technique may take longer to learn. What are some common dance injuries? Hip and Achilles tendinitis, hip impingement, stress fractures and snapping hip syndrome, which is sometimes referred to as “dancer’s hip.” That’s when you hear a popping sound as you walk or run; it can be painful and weaken the dancer’s performance. Hip impingement is an abnormal friction at the hip joint that can damage the joint over time. What can dancers and their parents do immediately and in the long-term to prevent injury? Most dance injuries can be traced to overuse, fatigue and poor nutrition, especially when one decides to specialize in dance early. No one really likes the immediate answer, but rest. Rest and find out what was injured so it can be treated. Often, overuse injuries in young athletes are due to muscular strength imbalances. This can be addressed with strength training. When looking for a trainer, make sure you look for an appropriately certified trainer. I recommend finding someone who is a certified strength and conditioning specialist (CSCS) or certified exercise physiologist (EP-C). These trainers are certified by the National Strength and Conditioning Association (NSCA) and the American College of Sports Medicine (ACSM). Over a career, regular strength and conditioning can help reduce injury risk. Weight-lifting also increases the strength of tendons and bone mineral density, reducing the risk of osteoporosis later in life. Nutrition can play a critical role in injury prevention because of its role in recovery from training. It is important that all athletes consume enough protein because it helps our muscles repair itself. For athletes, the recommended intake is 1 gram of protein per pound of body weight. This is higher than the RDA because of the higher rate of muscle damage and breakdown that happens in athletes. How can dancers speed up recovery time? Increase protein consumption, especially if the injury is musculoskeletal. Increased protein consumption increases the availability of the building blocks we need to grow and repair muscle.